29 October: Another hazardous building is demolished in Mojave, eliminating another blemish on the community and paving the way for future development. This building marks the 13th structure to be demolished in Mojave this year, and is the second on the 15900 block of K Street alone. This house was demolished by the owner, and eliminates the last derelict structure between Space Port Court and Mojave’s KCROP. The Mojave Foundation is proud to work with property owners and Code Compliance to eliminate blight and deterioration, and assist in demolition when necessary. Eliminating vacant derelict buildings removes one of Mojave’s biggest sources of drugs and vagrants, and makes the entire community healthier and more confident. 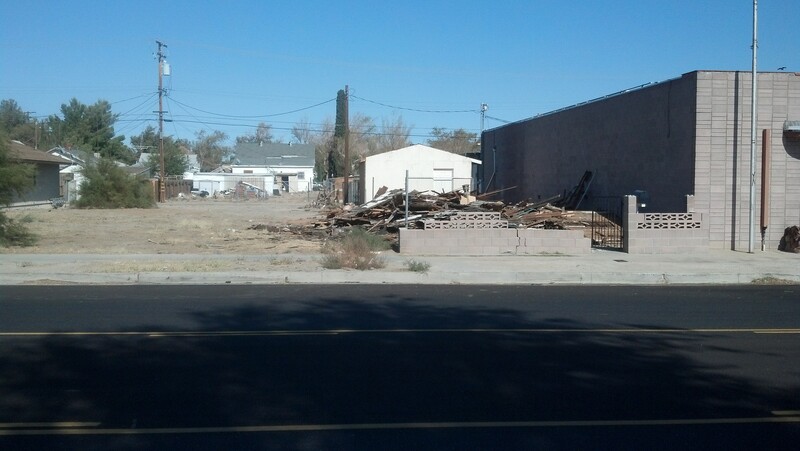 This entry was posted in Beautification, demolition, Kern County Code Compliance, Mojave CA and tagged Code Compliance, Demolition, K Street, Mojave on October 1, 2014 by mojavefoundation.